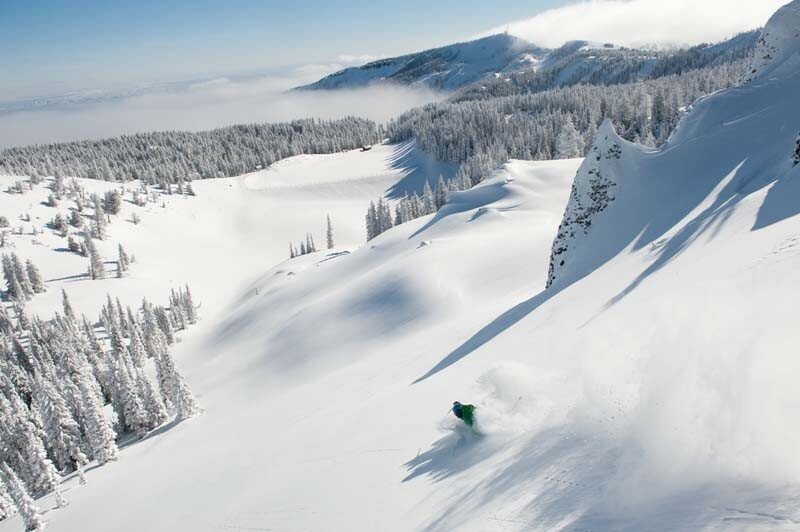 Located only 12 miles from Wenatchee, Washington, Mission Ridge is built into a basin on the eastern side of the Cascade Mountains and known for having 300 days of sunshine annually compared to other mountains in Washington. Mission Ridge features 2,000 accessible acres with a vertical rise of 2,250 feet, and 36 designated trails serviced by four lifts and two rope tows. With a terrain rating of 10% beginner, 60% intermediate and 30% advanced, skiers and riders have access to groomers, chutes, bowls, and backcountry for those who prefer the more extreme. Base area restaurant and mid-mountain cafe and barbeque; over 30 restaurants and lounges in Wenatchee, many with entertainment. Wenatchee is 12 miles from the ski area. Ski shop, child care for ages 3 months-6 years. Full shopping and services available in Wenatchee. First aid at the area; Cental Washington Hospital, 13 miles away. Convention Center available for meetings. Ski rental and repair shop at area. Ski classes offered for alpine, snowboarding, first time skiers, lessons for all ability levels, and Kid's Club Ski School.